Melbourne four-piece City Calm Down are thrilled to announce they will hit the road in September, embarking on their biggest capital city shows to date. The tour will also include gigs in Hobart and Wollongong. Current single Border On Control is building up the hype, while debut LP In A Restless House landed triple j’s Feature Album and scored praise from the likes of NME and Apple’s Beats 1... These shows will be huge! Recently highlighted by NME as one of THE bands to check out at Brighton’s The Great Escape, enjoying a set at Liverpool Sound City and selling out London headline shows, City Calm Down’s previous album tour saw thousands of tickets quickly snapped up across 10 sold-out dates. 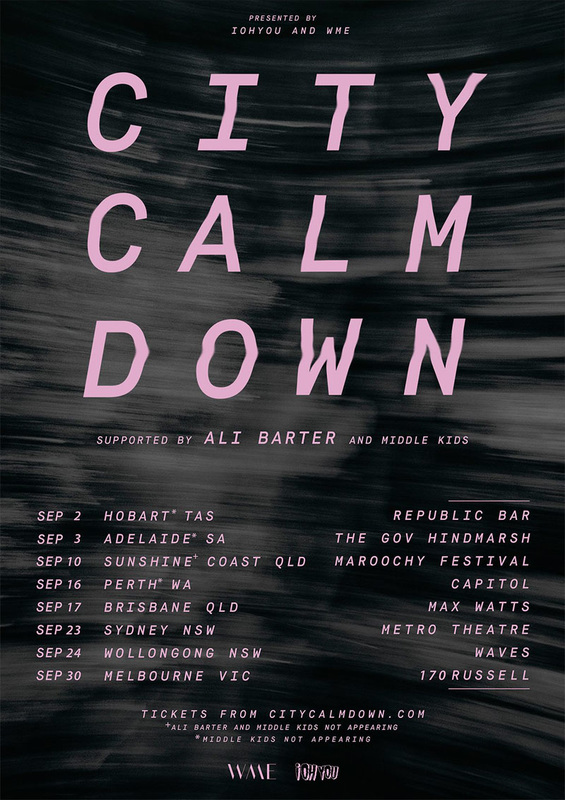 Joining City Calm Down are two special guests: Ali Barter (all shows except Maroochydore) and Middle Kids (Brisbane, Sydney, Wollongong, Melbourne). Melbourne’s Barter recently covered Tame Impala’s Cause I’m A Man for Like a Version, and her own Far Away, wooing crowds with a stand-out set at 2016’s St Jerome’s Laneway festival. With their first single Edge of Town landing triple j play and FBi 94.5’s Independent Artist of the Week, expect big things from Sydney trio Middle Kids. Before these spring tour dates, City Calm Down will also play Byron Bay’s sold-out Splendour in the Grass, taking to the stage on Sunday 24th July. With their last tour completely selling out, and these September dates promising to be epic, grab your tickets quick-smart to avoid missing out! Catch City Calm.